In October 2013 I joined the digital music team at Minnesota Public Radio (a.k.a. American Public Media), where I edit and write stories for the websites of The Current, Classical Minnesota Public Radio, and the recently-launched YourClassical. Among my responsibilities is coordinating the Current’s college contributors program, a program supporting and developing the next generation of music journalists by providing Minnesota college students with training and opportunities to contribute to our Local Current blog. I also help run social media for all the music services; I have primary responsibility for the @LocalCurrent Twitter account and helped to launch the Current’s Tumblr blog. 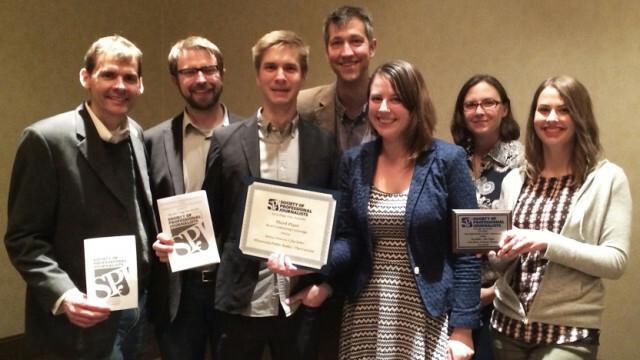 This year, our team was honored to be presented with two Page One Awards from the Minnesota chapter of the Society of Professional Journalists. We shared a first place award for Best Institutional Social Media Account for @TheCurrent; and Andrea Swensson and I shared a third-place award for Best Continuing Coverage for our stories about the 400 Bar’s ill-fated move from Minneapolis’s West Bank to the Mall of America. • Bob Dylan’s Shadows in the Night: Why Sinatra? • Remembering Michael Jackson—but how? • Is new age music making a comeback?